Remember Plantera? The point and click game Ratalaika Games brought to Wii U and 3DS this year? As previously revealed, it’s getting the Nintendo Switch treatment and its release will happen a hell of a lot sooner as Rainy Frogs has revealed said release will take place next month! Just like we said before, the Japanese release of Plantera DX (Deluxe), does support English so if you can’t wait until the game comes West much later on this year (previously stated to be around the Holiday season,) you can of course just get the game next month. It is pretty much the same as the Wii U and 3DS game, but there are of course differences. Differences which includes a new purchasable animal such as a horse. A character called a Loot Knight who will pop up from time to time, whom when clicked upon, will drop coins. The graphics have been enhanced, a jukebox has been added, which does feature a new song. 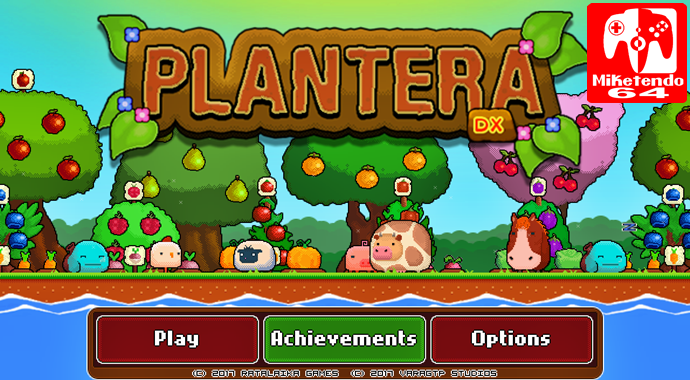 It has also been said the Switch version is three times bigger than the 3DS game and Plantera DX maintains touch-screen controls. Now while Ratalaika Games themselves are not responsible for the Japanese release, they will be handling the Western one for Europe and North America and are considering adding even more content to the game, but if such content does happen, it will not be added to Plantera DX until the Western release does happen. At which time the “new” content will also be added to Japanese version as part of a free update, but the content would strictly be for the Switch version of Plantera, much like the new content Plantera DX has, is just for Switch. While this is by no means the last we’ve heard about the Switch version of Plantera DX, this is everything we have for today. But just as soon as more details arrived, you can expect to find it right here at miketendo64.com!